Alderney produced one of their best-ever Muratti performances but could not stop Guernsey making the 100th final with a 1-0 victory at the Arsenal. 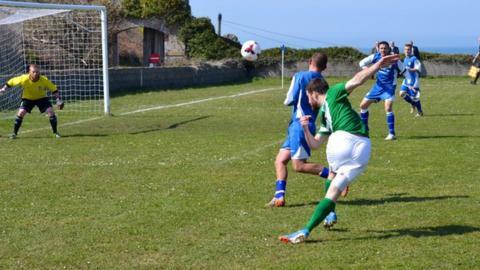 Ross Allen's penalty just before the break was the only goal as Guernsey dominated but struggled to finish. Many expected the visitors to score freely, but Alderney 'keeper Jamie Laband made several outstanding saves. Alderney's defence held firm in the second half for their best result since a 1-0 loss to Guernsey in 1999. The victory books Guernsey's place in the final against Jersey at Springfield on 14 May. "The lads were magnificent for the whole game," said Alderney's manager Alan Adamson. "With some of the results we've had recently, that feels like a win for us. "This was the best result in my 25 years involvement with Alderney football." Last year Alderney's club side, Alderney Nomads, were forced to pull out of the Guernsey league as they could not raise a side on an island, which according to Alderney's 2013 census has 1,903 people living on it. Alderney finished last at last summer's Island Games in Jersey, conceding 21 goals and scoring just three in their four games.